If you have read craveDFW for any length of time, you know we adore our tacos. We create an annual taco list and one of the highlights is usually the gas station trompo taco across from Bachman Lake off Northwest Highway. Some years ago I was sharing taco secrets with Chef Kent Rathbun, and he claimed this to be his most favorite taqueria in Dallas. I pretty much agreed. These are amazing little tacos of grilled meat sliced off a trompo, which is Spanish for ‘spinning top’. How this all works is that pork is marinated over one or two days in a combination of dried chiles and then slowly cooked with a gas flame on a vertical rotisserie called the trompo. Perched on top of the trompo of meat is generally a whole pineapple that drizzles its juices downward, further breaking down the meat with flavor and enzymes to make it even more tender. There is a huge population of Lebanese in Mexico and a similar dish is served called Tacos Árabes, which originated in Puebla in the 1930s from Lebanese-Mexican cuisine. 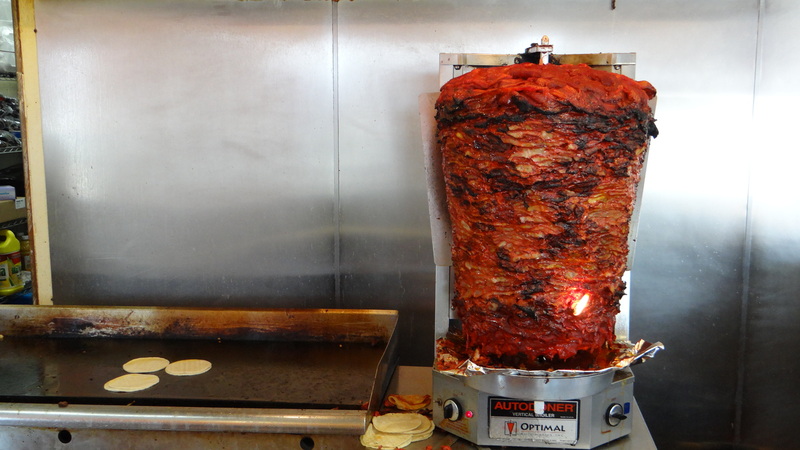 Tacos Árabes use shawarma-style meat carved from a spit, but are served in a pita bread called pan arabe. If you have ever met Dallas Chef Abraham Salum who operates Komali, he is of Mexican-Lebanese descent. The tacos at Bachman Tacos are an excellent example of the Trompo Taco, which is actually a tricked out Taco Al Pastor. The meat is marinated and skewered daily, and sliced to order. Each slice is a bit charred from the sugars in the pineapple giving it this crispy texture and amazing flavor that pops with each bite. The tacos are served with grilled onions and peppers, along with a sprinkling of fresh onion and cilantro. But you won’t need the extra toppings, the tacos stand solid on their own. You may wish to use the delicious salsa verde that is in a portion cup on the side for good measure. It is Taco Tuesday! 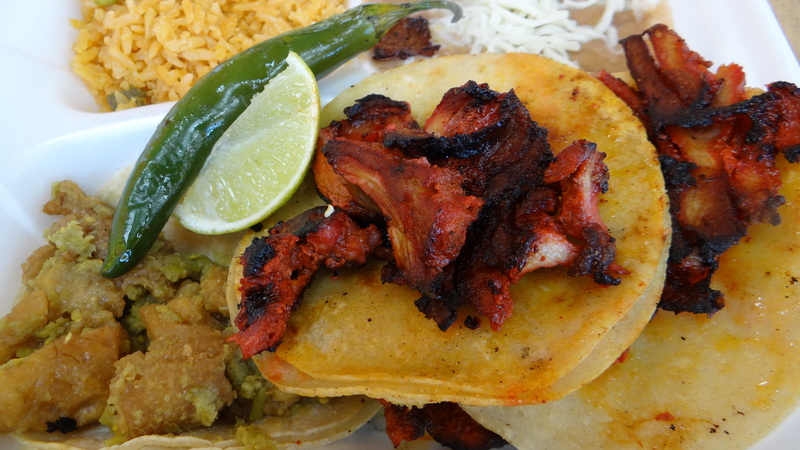 Here is a cool visit through the streets of Mexico to eat Trompo.